Situated in the midst of the hills surrounding the Lake of Caldaro in the far north of Italy, the Manincor estate was founded in 1606 by the colourfully named Hieronymus Manincor zu Ehrenhausen. The ancestors of today’s owner, Count Michael Goëss-Enzenberg, became related to Manincor zu Ehrenhausen in 1662 through marriage, so there is a direct lineage of some 350 years. Count Michael has owned and run Manincor since 1977, in which time it has become the largest estate winery in the Süd Tirol. A brand new winery opened in 2004, built substantially beneath the vineyards, so as not to disturb the landscape of the area. A multitude of small vineyard parcels is farmed, at 220 – 500 metres above sea level, with a wide variety of soils. Winemaking is as natural as possible, and the slope of the cellar site is utilised to move grapes and must by gravity though the winemaking process.Three ranges of wines are produced, poetically described as “Hand – Scooped out from the soil,” “Heart – Cultivated with love,” and “Crown – Developed without compromise”. I tasted four wines, two from the ‘Hand’ selection and two from the ‘Heart’ selection. Manincor’s Moscato is spontaneously fermented using natural yeasts where possible, at low temperatures to retain the Muscat’s aromatic character. It is then matured on the lees in steel and large, old wooden vats. It has a very expressive Muscat nose, with vivid floral and grapy aromas, a hint of grapefruit zest and a very subtle background spiciness. On the palate this is punchy and crisp, with a light-bodied, dashing fruit quality of citrus and crunchy apple, but those little glimpses of floral and exotic, peachy notes are there. The acidity is clean, tangy, dry and fresh, in a wine that has some structure and substance, despite its easy-drinking charms. This wine is closed with a Vinolock glass stopper. 88/100. £15.25, D’Vino. See all stockists at wine-searcher. This blend of Chardonnay and Sauvignon Blanc, with a little Viognier, comes from steep, west-facing slopes at an altitude of around 380 metres. It is fermented in large oak casks, after which it matures for a further 10 months or so before bottling. It has a bright, green-tinged lemon colour, with arrestingly rich and honeyed aromas of oatmeal and acacia honey, with some nectarine and slightly candied, almost tropical fruit nuances. On the palate this has quite powerful concentration, with a robust chardonnay core that is quite dense and mouth-filling, though an edge of savoury, vibrant lemon and lime acidity pushes through. There is good fruit sweetness here, and plenty of intensity, yet the wine doesn’t quite carry that level of interest through to the finish. A good and interesting wine and very stylish, though perhaps lacking a bit sharpness and ultimate complexity. 89/100. £20.00, see all stockists at wine-searcher. Manincor’s Bordeaux(ish) blend is made from Merlot, Cabernet Sauvignon and the indigenous Lagrein, matured in used oak barriques for 10 to 12 months. It comes from selected vineyard sites and is harvested quite late, in late September or early October. The nose has a lovely, suffused, mellow character, with warming berry fruits and clove and cinnamon spices. On the palate there’s a smooth textured, medium-bodied appeal, with plenty of red fruits – cherry and raspberry – given some weight and texture by rich, velvety tannins and a certain robustness from the Lagrein. With a long, well-balanced finish, this is very good indeed. This wine is closed with a Vinolock glass stopper. 90/100. £16.99, D’Vino. See all stockists at wine-searcher. 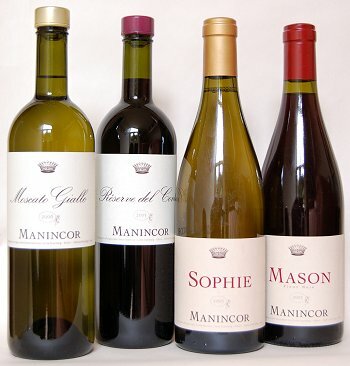 Manincor’s Pinot Noir comes from a single vineyard at an elevation of 400 metres. After fermentation, the wine spends around 10 months in French oak barriques, about one-third of which are new. It has a lovely bright, light ruby/crimson colour, and a very inviting, bold fruitiness on the nose, with aromas of raspberry and ripe red cherries straight from the tree, and a subtle undertow of earthiness and mellow, quite smoky aromas. On the palate this medium-bodied wine has really beautiful fruit quality, with huge sweetness to the fruit and a rounded, mouth-filling volume, but with terrific verve and vitality. This is a really lovely Pinot, expressing excellent fruit and just hints of a velvety, richer character, but all the time staying poised and full of life. 92/100. £25.00, see all stockists at wine-searcher.